Transparency Market Research (TMR) has published a new report titled, “Blood Group Typing Market - Global Industry Analysis, Size, Share, Growth, Trends, and Forecast, 2018 to 2026.” According to the report, the global blood group typing market was valued at US$ 1,500.0 Mn in 2017 and is projected to reach US$ 3,556.0 Mn by 2026, expanding at a high CAGR of 10.3% from 2018 to 2026. Increase in blood transfusion rate across the world is anticipated to fuel the global blood group typing market during the forecast period. North America and Europe are expected to dominate the global market during the forecast period. The market in these regions is primarily driven by the increase in government initiatives and a highly structured health care industry. The market in Europe is projected to expand at a high growth rate of 10.1% from 2018 to 2026. The market in Asia Pacific is expected to expand at a rapid pace during the forecast period. The market in Asia Pacific is anticipated to expand at a high CAGR of 10.7% from 2018 to 2026. The blood group typing market in Latin America is likely to expand at a moderate growth rate during the forecast period. In terms of technique, the PCR-based segment is projected to account for a dominant share of the global blood group typing market during the forecast period. The segment is anticipated to expand at a CAGR of 10.6% from 2018 to 2026. Dominance of the segment is attributed to the increasing preference for PCR-based technique because of rising incidence of major chronic diseases such as aplastic anemia, sickle cell anemia, leukemia, and traumatic injuries, resulting increase in blood transfusion rate in countries across the globe. Additionally, increasing the usage of PCR-based technique in the detection of rare type of blood group is a key factor that is expected to fuel the segment. The microarray-based segment held a major share of the market, following the PCR-based segment, due to increasing awareness about this technique. 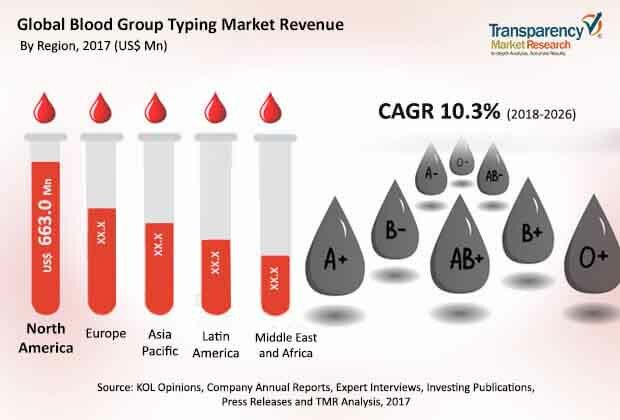 Assay-based technique and massively parallel technique segments accounted for around 30.0% share of the global blood group typing market, in terms of revenue, in 2017. The report offers detailed segmentation of the global blood group typing market based on product, technique, test, and end-user. In terms of product, the market has been classified into instrument (automated, semi-automated, and manual), consumables (reagent, test kits, antisera, others), and services. The consumables segment is estimated to hold a leading share of the global market during the forecast period. Higher share held by the segment is attributed to the constant development of new molecular diagnostic test kits and reagents, which reduces the turnaround time required for results, and increase in number of blood transfusions, globally, every year are key factors fueling the consumables segment. In terms of test, the antibody screening test segment is projected to hold a dominant share of global blood group typing market by the end of the forecast period. The segment is likely to expand at a CAGR more than 10.0% between 2018 and 2026. Major factor responsible for the dominance of this segment is the rise in incidence of transfusion transmitted infections (TTIs), especially in lower-middle income and low-income countries. The ABO blood test segment held a major share, following the antibody screening test, due to increasing utilization of this test for blood grouping. HLA typing and antigen segments accounted for around 30.0% share of the global blood group typing market, in terms of revenue, in 2017. Based on end-user, the hospital segment accounted for a leading share of the global blood group typing market in 2017. It is projected to gain market share by the end of 2026. The segment is anticipated to expand at a CAGR of 10% during the forecast period due to the large patient population undergoing surgical procedures in hospitals requiring blood transfusion, and increasing emphasis on blood grouping and patient testing. Clinical laboratories was a prominent segment, following the hospital segment, of the market in 2017. This is due to the rise in number of clinical laboratories for blood grouping and screening. This, in turn, is likely to drive the clinical laboratories segment during the forecast period. The blood group typing market in North America is driven by high percentage of active and voluntary blood donors in the U.S. and Canada, increasing number of blood transfusions per year in the region, and various blood transfusion policies being implemented regarding safety and testing of blood for infectious diseases. This, in turn, is further boosting the demand for blood grouping instruments and kits and reagents in North America. Moreover, a large number of players in the U.S. are focusing on R&D in order to introduce new products. The U.S. is an early adopter of innovative products, as most pharmaceutical products are first launched in the country. This is likely to boost the market in the country in the near future. The global blood group typing market is fragmented, owing to the presence of several small- and large-scale companies. However, the market is dominated by a few major players with strong global presence. The report provides profiles of leading players operating in the global blood group typing market. Key players in the market include Grifols, S. A., Bio-Rad Laboratories, Inc., Merck KGaA, Ortho Clinical Diagnostics, QUOTIENT LIMITED, BAG Health Care GmbH, Immucor, Inc., Beckman Coulter, Inc. (Danaher Corporation), Agena Bioscience, Inc., Rapid Labs Ltd, and Novacyt Group.